NEW YORK -- City health commissioner Dr. Mary Bassett said officials were still determining the recent activities and contacts of Dr. Craig Spencer, who was diagnosed with the Ebola virus Thursday. 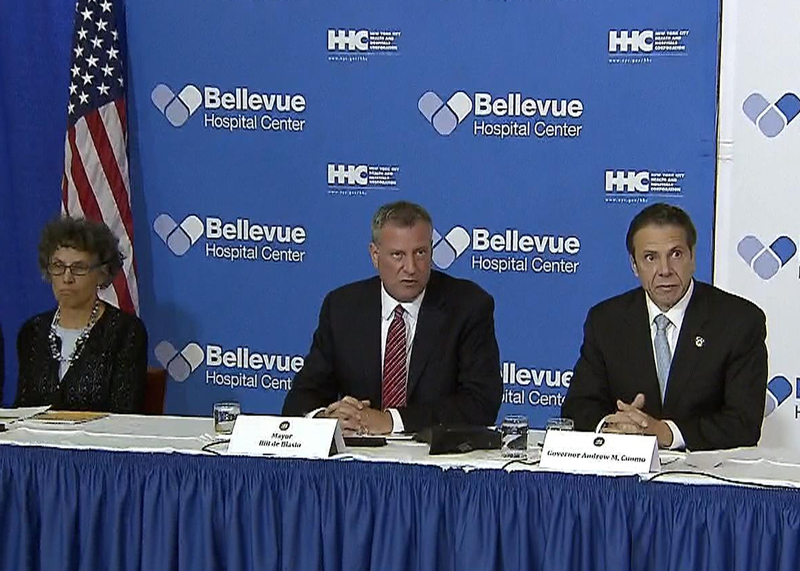 At a press conference with city and state officials, Bassett said Spencer was being treated in isolation at Bellevue Hospital, which has been preparing for months to be New York City's main Ebola treatment center. Spencer's fiancee and two friends have also been quarantined but none are symptomatic. City officials say Spencer acknowledged riding the subway and taking a cab to a Brooklyn bowling alley in the past week before he started showing symptoms. The Department of Health was across the street from Spencer's Harlem apartment building Thursday night, giving out information to area residents. Investigators are using transit records to help piece together his exact movements, but insisted the public was not at risk. Mid-September: Spencer leaves for Guinea to work with Doctors Without Borders at an Ebola treatment facility, according to his Facebook page. October 12: Spencer ends his assignment in Guinea, according to Bassett. October 14: Spencer leaves Guinea for Brussels, Belgium, en route to the U.S.
October 17: Spencer returns to New York City, arriving at John F. Kennedy International Airport. Wednesday: Feeling well, Spencer went for a three-mile jog and bowling with friends in the Williamsburg neighborhood of Brooklyn, Bassett said. Thursday: Spencer developed diarrhea and a fever, which eventually rose to 100.3 degrees. He and his fiancee made a joint call to Doctors Without Borders and the city health department to detail his symptoms and his travels. EMTs in full protective gear arrived and took him to Bellevue in an ambulance surrounded by police squad cars. Hours later, New York Mayor Bill de Blasio and others confirm that Spencer has tested positive for Ebola.